Many hand injuries come about from repetitive motions of the hand. This results in common injuries like tendonitis, tennis elbow, and reduced joint movement. Many jobs require a person to exert continuous compression and tension with the hand muscles that the muscles never get enough counter balance exercise. The muscles that close the hand get tighter while the muscles that open the hand get weaker which leads to motion problems later on. Hand injuries, trauma, arthritis, and stroke can also cause hand motion problems. A stress ball, or squeezing exerciser in these cases will only contribute to the problem. To counteract this repetitive stressful motion, you need a hand exerciser than can continuously offer resistance opposite of your activities. That's why a hand exerciser like the Xtensor was invented. The Xtensor fits like a glove and provides tension against opening the hands. So everytime you open your hand, the muscles responsible for extending your fingers build up strength. 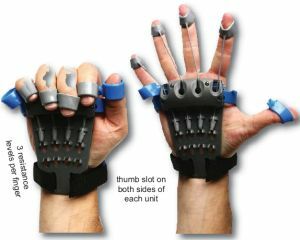 The Xtensor offers 3 levels of restance for each finger which make it great for continuous treatment of extension exercises.